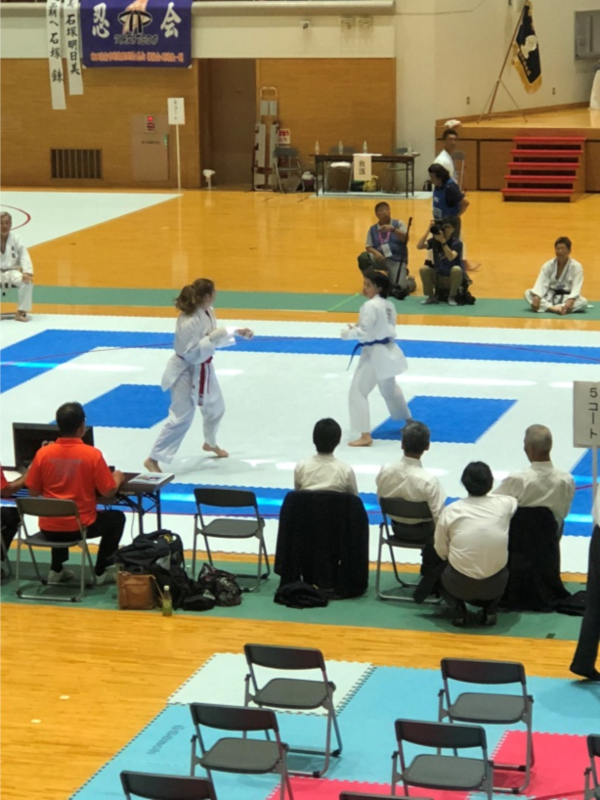 Over the past two weeks Jade has been in Japan training under the top Japanese sensei and also competed in the All Japan Goju Karate tournament in Akita. Jade’s trip started in Osaka where she stayed there for majority of her trip. She was invited to train at both the University and High school training. Both trainings were really intense in the 38 degree heat, with sometimes very little air conditioning. The atmosphere within the training centres is very different compared to New Zealand trainings, but she really enjoyed this amazing opportunity to train with some really good fighters. 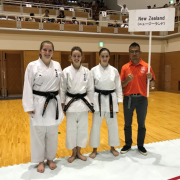 Jade and the rest of the NZ team then had training with their top three sensei. 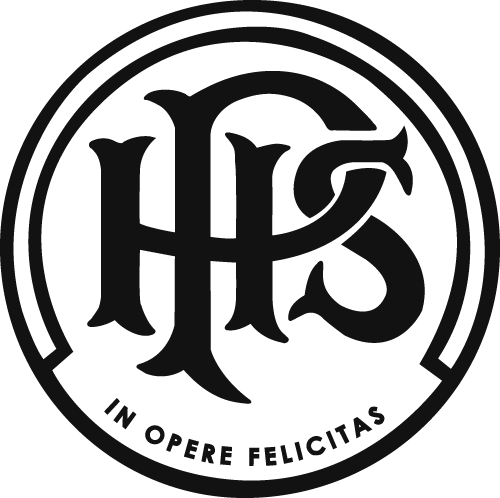 As usual this training was very good and all of the members gained a huge amount of knowledge on the kata. 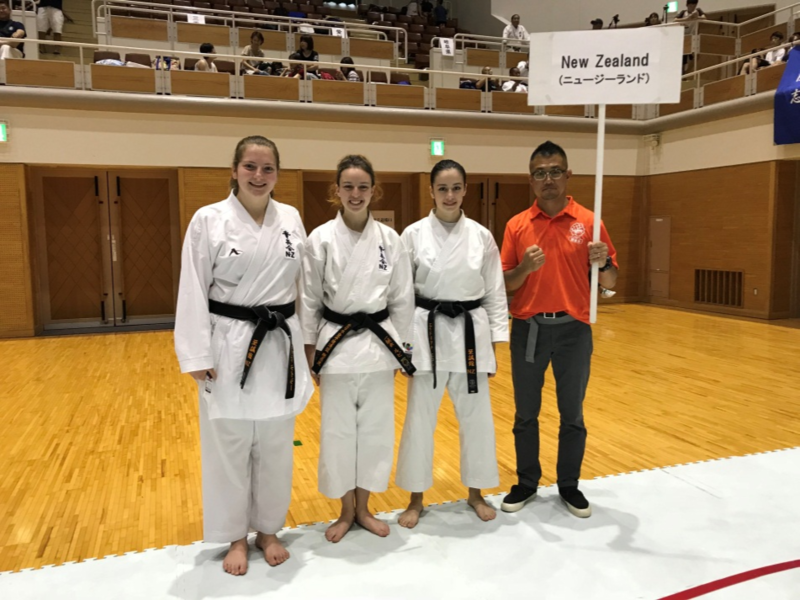 Before leaving Osaka, Jade and fellow teammate Ruby, went for their Jitsue Kai grading and both passed successfully, meaning that Jade is now Nidan in her club. The team then left to Akita and attended the JKF seminar where their kata was picked to pieces and put back together by roughly 15 of the top JKF sensei in Japan. After a day and a half of the seminar Jade graded to JKF Nidan, meaning that she is now second dan in her style, which is acknowledged around the world. The last few days were spent at the arena where Jade competed in the High school girls’ 1st-3rd grade division. She had an awesome first fight , winning 6-0 with 45seconds left to the fight which put her in the finals day on the Sunday. The next day she had a very tough fight, as she came up against the winner of the division. Jade fought well, but could not beat her. This loss was unfortunate as in this tournament there is no repechage, meaning that Jade had no other fights. These results still meant that Jade placed top eight in her division, which is an awesome achievement as Japan competitors are very experienced and compete at high levels. Overall, it was a successful trip with Jade passing both her gradings and fighting really well in the tournament. She looks forward to returning next year and competing again.